S2 Edgehill Studio Apartment Finding a great studio apartment to rent in Atlanta can be a long search but that doesn't mean you can't get an affordable luxury studio. 935M Apartments is located in the heart of Midtown Atlanta and perfect for Georgia Tech students. The S2 Edgehill Studio flat is 520 square feet of luxury space. 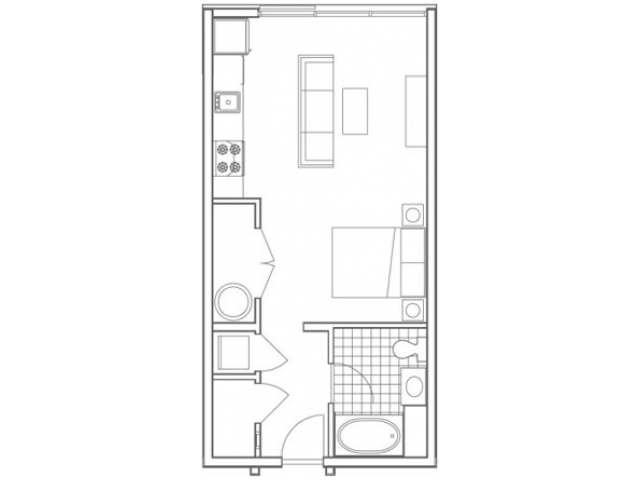 This pet friendly studio has one bathroom and a wide open space perfect for your bed, couch and kitchen area. We allow up to two pets, so you and your furry friends can feel right at home. For a small apartment like Edgehill, we've made sure to include ample storage space, quick access to the bathroom and an open living area big enough to fit a couch and queen sized bed. Our Location in Midtown Atlanta Whether you're a Georgia Tech student or work downtown, the Edgehill studio is a great option for busy single residents. The 935M apartment complex is located in the center of Midtown Atlanta only blocks away from Georgia Tech. The area also boasts great coffee shops, movie theaters, gyms, retail shops and restaurants. And whether you need to skip town or just get across town, the Edgehill studio is close to Northside Drive and I-85 for a quick escape. Contact 935M Apartments to Reserve Your New Studio Interested in renting the S2 Edgehill studio apartment? Email us or call our main office at (866) 991-5178. We're open Monday to Friday 9 a.m. to 6 p.m., Saturday 10 a.m. to 5 p.m. and Sunday 11 a.m. to 5 p.m. and located at 935 Marietta St. Speak with our friendly staff to reserve your space in Atlanta, Georgia's best luxury studio apartments.